No one wants a lollipop stuck to them. Adam was at the doctor one day and said he saw a little cat scurrying about outside. Interested to know more, since I have invaded his brain with cat curiosity in our time together, he watched to see what would happen. And it was….A SEWER CAT! Living like vagrants in the underbelly of the city, sewer cats dominate the night. Rarely visible in the day, they may appear in times of desperation for fish bones or to pickpocket you. They are players in the game and work with whichever side benefits them most, be it Ninja Turtles or Shredder. Sewer cats scheme and do not like to be challenged. Plus, they smell. We told Duncan and Smudge that they are lucky not to be sewer cats, though we are highly considering it for Duncan. He should just have his own sewer portal nearby so he doesn’t have to keep peeing on the carpet. Nasty. He’s already got the cattitude for a sewer cat. Flashback drawing: Please fasten your seatbelt. There’s going to be a little turbulence. Poor sewer cat. Will he ever find a home? There are two strays that roam my neighborhood. Our first spring (last year), one of the cats, I think the tuxedoed one, would sing throughout the night. My Greysa fancied he was singing to her. When she gets snippy, I tell her that she has it so good and should thank her lucky stars to live in an apartment. 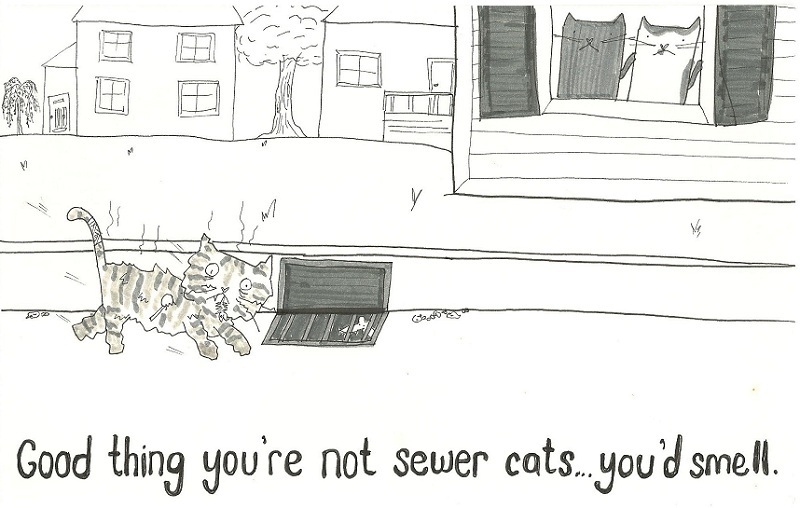 I’ve never thought of strays as sewer cats, I guess because we don’t have much in the way of deep sewers in Florida.